HBW reports on the latest permitting data for new swimming pool construction activity in Texas. During the month of June, Texas experienced a slight month-over-month decrease (-5%) in new swimming pool construction. During the one-month period, there were nearly 720 new swimming pool permits with a total construction value of approximately $36M added to the HBW database. Out of the four major metro areas reviewed (Dallas, Houston, Austin, San Antonio), the Dallas area continued to lead for highest volume of new swimming pool permits (361 permits), while Houston moved in take top spot for highest average value of new pool construction (average construction value: $57,026). 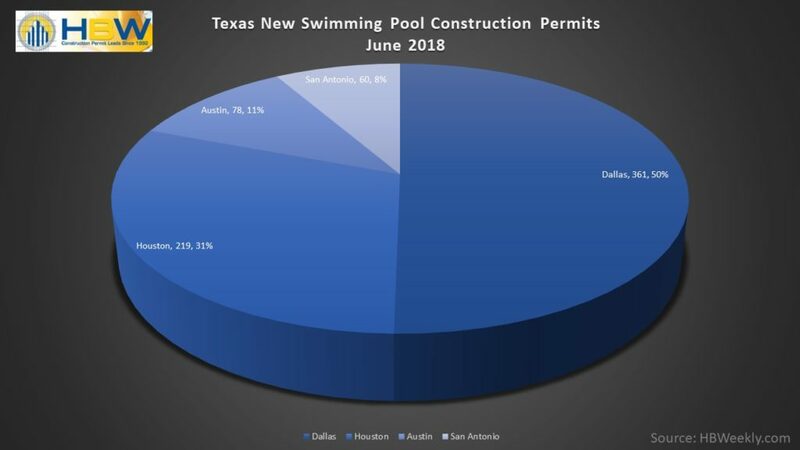 Dallas was the only area to experience a spike in swimming pool starts; last month, there were just over 360 new pool permits with a total construction value of nearly $16.7M, reflecting an 8% month-over-month increase in new pool construction activity. The average value of pool construction in the area was just over $46k, and the counties with the greatest concentration of swimming pool starts were Tarrant (107 permits), Dallas (86 permits) and Collin (86 permits). Last month, the Houston area ranked second highest for total swimming pool starts. In June, Houston experienced a 15% month-over-month decrease in new pool construction resulting in nearly 220 pool starts with a total construction value of approximately $12.5M. As previously mentioned, the average value of new pool construction was higher in Houston than other major areas reviewed coming in just above $57k. More than half of all new construction took place in Harris County (139 permits). New swimming pool construction in Austin has remained somewhat steady over the last couple of months. Last month, there were 78 new swimming pool permits with a total value of nearly $4M added to the HBW database; this reflects a 5% month-over-month dip in new pool construction, but considering the total number of permits, it is a minor fluctuation. The average value of construction was on the higher end of the spectrum (average value: $50.3k), and nearly all new pool construction took place in Travis County (64 permits). Swimming pool construction figures for San Antonio reflect a 15% month-over-month decrease, resulting in 60 new pool permits with a total value of $2.6M on file for June. The average value of construction was lowest in the San Antonio area at $43,866, and nearly all new pool construction took place in Bexar County (49 permits). To gain more information on the builders and permits for the swimming pool construction activity above, check out HBW for your copy of the latest construction data reports. 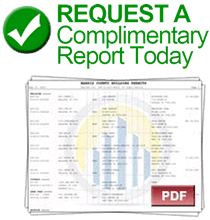 To gain access to the HBW database and receive custom and detailed reports on the latest residential and commercial building activity in Florida, Georgia, Texas, Alabama, and Oklahoma, please contact HBW for details.